Racing fans, especially those dialed into the LeMans scene of the 1970s know Porsche 917s were king of the hill, or racetrack, as the case may be. These Germanic wonders created massive horsepower and their sleek lines and body work created massive downforce. They were the unchallenged endurance racers of the time. Norev, a French die-cast model maker, introduces a new 1:18-scale collection of 917s that raced at LeMans in France, along with other noted circuits worldwide. The review car was the blue and green Martini & Rossi Racing Team’s No. 35, driven by Gerard Larrousse and Gijs Van Lennep in the 6-hour endurance race at the famous Watkins Glen circuit in 1970. The 917K was the highly successful short-tail version of the 917, winning the 24 Hours of LeMans in both 1970 and 1971. The long-tail models originally introduced by Porsche in 1969 were highly unstable. The short tail Kurzheck version, which is where the K comes from, ran away with the sports car championships for both years. In 1971 a 917K was clocked at a top speed of 243 mph at LeMans and was the presumed victor, even before the race was run. The Martini team was a popular and successful entrant for years and this model is of Martini’s “psychedelic” livery that featured a wild blue and bright green paint scheme that excited fans and journalists, even though it was not, ultimately, a winner. 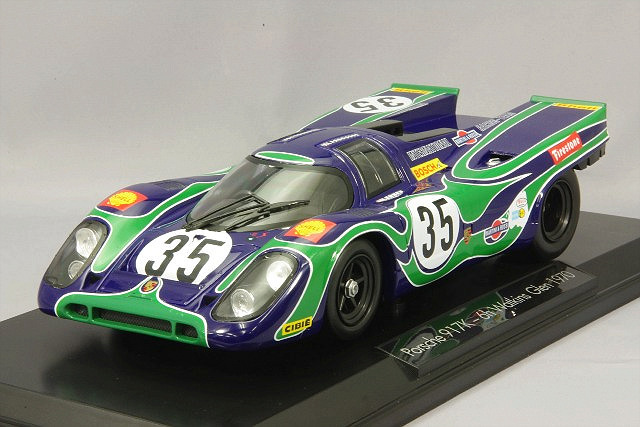 This model is of the 917K that ran to ninth place at the 1970 6-Hours of Watkins Glen in upstate New York. This was the final year of the original Watkins Glen circuit’s use, being revamped for the 1971 season. Watkins Glen was for many years the site of the U.S. Grand Prix for Formula 1 open-wheel racers. The Martini car ran a 4.5-liter Flat-12 engine and was well behind the winning 917K driven by Pedro Rodriguez and Leo Kinnunen from John Wyer Racing. Norev’s creation is a handsome sealed body model, with a well-executed paint job that perfectly matches the original’s colors and markings. It’s great for filling a void in your collection, or for giving you one of the most dramatic looking 917Ks that was ever raced. Markings are minimal, considering what most racers look like today. There’s a giant white circle on the doors, hood and tail with a black “35” in the middle, and of course the gnarly green flame-like stripes spread from nose to tail. Norev also delivers the Shell, Martini & Rossi, Cibie, Firestone, Bell and Porsche logos on the sides and nose. Driver names are above and below the side doors’ windows. While there’s a Firestone logo on the car, the tires are black plastic with no logos and black plastic 5-spoke racing wheels with silver hub nut. Being sealed, nothing opens to let you see much of the black interior and dash, although you can tell the layout is fine. And let’s be honest, the interiors of real racers are pretty stark generally. There’s a black plastic shroud over the big 12-cylinder Porsche engine, with tan turbo fan exposed in its middle. The sealed front lights look realistic and there are chrome gas filler caps on the top of either side’s bodywork. All the vent and door creases look accurate and there’s a black screen mesh on the nose. The model’s rear is mostly black plastic with red brake lights and some exhaust and differential detailing. Windows are trimmed in black and there’s a large plastic wiper to clear the windshield. If you want more detail and opening features you’ll need to spend more, probably an additional $100. 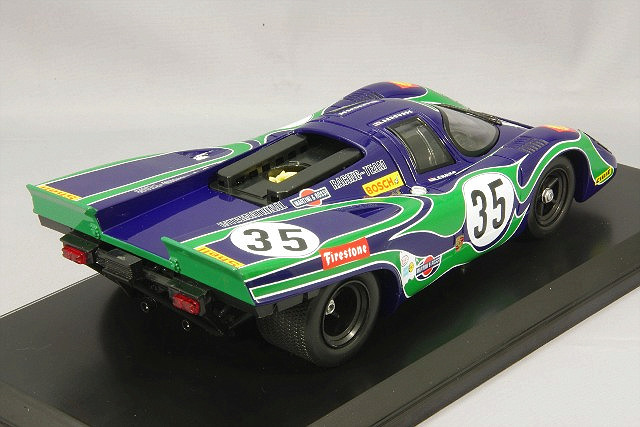 But if you want a fine recreation of a beautiful 917K, Norev has several choices for you, including this brightly colored model, one of just 1,000 being made.